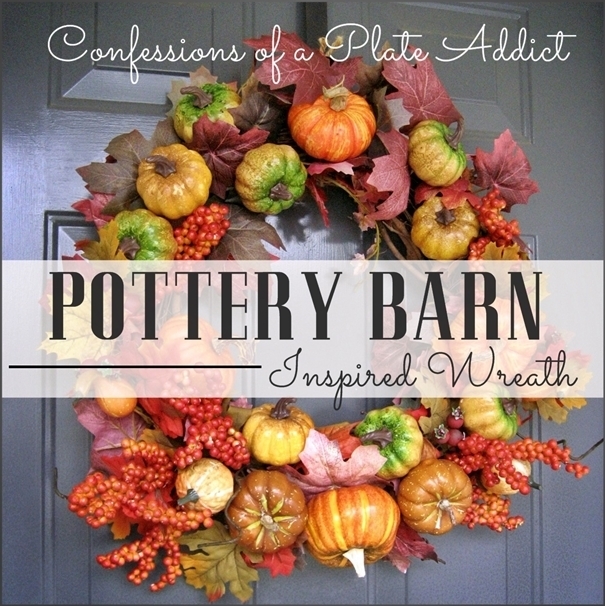 CONFESSIONS OF A PLATE ADDICT: Pottery Barn Inspired Fall Wreath...and It Was Free! 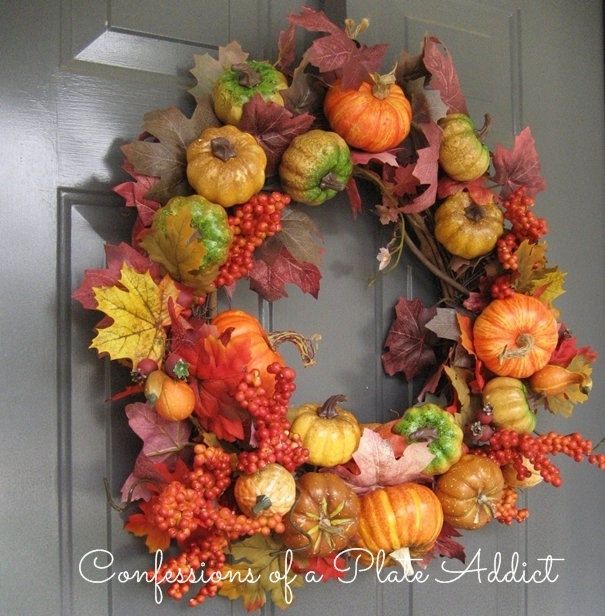 Pottery Barn Inspired Fall Wreath...and It Was Free! I am at it once again…being a big fat copy cat! As usual, I have been stalking perusing the pages of the Pottery Barn catalog to see which designs I can recreate for less! So when I saw their Harvest Pumpkin Wreath, I knew I had found my latest candidate! Love all those little pumpkins and those leaves and berries! Their colors are a little muted for me, though…a “fall is all about orange” kinda gal! And…at $99, the price is a little hefty! Then Baby Kitty reminded me that I already have absolutely everything that I need in my stash…and I mean everything! And I’ll bet you do, too! Woo hoo! This one is gonna be free! I am really excited to be able to add my berries since they will come from this Pier 1 berry garland that I bought on sale waaay after Christmas…a $35 garland for 90% off! I couldn't believe it…there were still three of them and I bought them all, so cutting one up won’t bother me! Wrap the leaf garland around the grapevine wreath, securing with florist wire. I suppose that you could just hot glue the pumpkins directly and skip steps 2-4, but I like things to be relatively symmetrical, so I wanted to arrange the pumpkins, stand back and see if I needed to move any. I am loving all of the wonderful fall colors and textures! And…best of all…mine was FREE! And you’ve gotta love free! 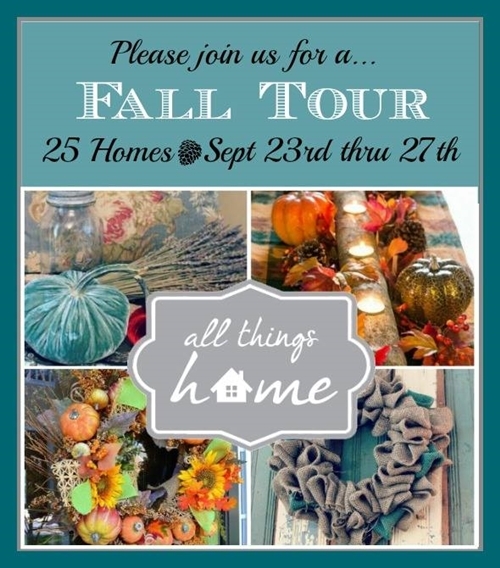 Now it’s hanging on my front door, waiting for you to come visit for the All Things Home Fall Tour! I am still spiffing up and tweaking, but I promise to be ready by Wednesday, September 25th, so be sure to mark your calendars. And…head over here to get all the details and see who else is on the virtual tour! Thanks for stopping by! I hope you enjoyed having a peek at my fall wreath! Please visit these wonderful bloggers and their beautiful blogs to see what they are up to and to find a list of this week’s participants! I plan to be a copy cat myself:) they had another wreath at pb I wanted for my own door. You did an incredible job recreating the wreath, Debbie! Love it and can't wait to see more of your Fall home! Your wreath looks wonderful, Debbie! I can't believe what a deal you got on those garlands. For toned down color I've white-washed artificial gourds with a off white, tannish paint. The pretty colors are there but I needed to blend them with some subtle-colored leaves. it's wonderful, thank goodness Baby Kitty reminded you that you had all the goods to make this!! Debbie outstanding job. Yours is even nicer. I love that Baby Kitty reminded you that you had all you needed already. Don't you just love that!! !, LOL!! It's very lovely Debbie and you always do such great tutorials too! I have looked everywhere on WalMart to find those metal containers. And I can't. Can you help direct me to the spot. Your copy cat version came out great. Love the colors! Love your wreath and the brighter colors! Yay Fall! You did an awesome job and you sure can't beat that price! It would be great to have you link to Seasonal Sundays this week. Beautiful wreath! Bonus for being free. Love it when a project comes together like that. Beautiful fall wreath. So great you didn't have to spend anything. I think I have some fall decor that I could pull apart and remake something new. I like yours ( I'm a brighter Fall color girl too) ! Love how you made yours way cheaper than PB! I am going to attempt one too. Thx for the tutorial! I love your pottery barn copy cat, it's beautiful! I just did a fall wreath this year for the first time as well. I think I'm finally getting ready for fall. Gorgeous! It's so full and glorious! LOVE! Very pretty! I think I see this project in my future! Thanks for the instructions! Awesome! I think PB marks their stuff up to compensate for all us copy catters! Ha! I like yours better, I agree you need some color for fall! Love the wreath you did a great job! Come link up to centerpiece Wednesday and share this post with us. This is elegant and beautiful! I love it! Come link up to the Fall Wreath challenge at The CSI Project. It is going on right now. So LUSH!! I like it even more than PB's! !